All you basketball fans will be excited about one of the latest announcements from Disney Parks Blog. 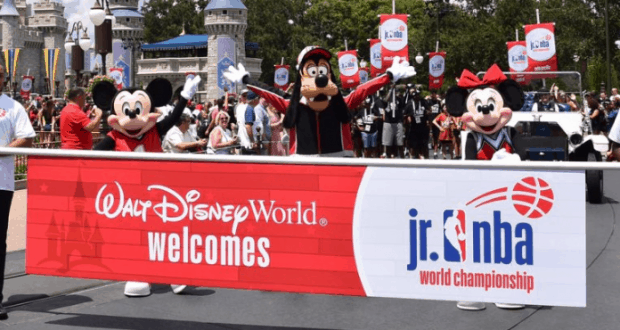 The ESPN Wide World of Sports Complex will host the inaugural Jr. NBA World Championship from August 7th through August 12th, 2018. This event will allow the top 13 and 14 year old boys and girls teams from all over the world compete in a 6 day tournament. The event will host 317 players from 35 different countries around the globe. During the event, there will also be a variety of basketball stars that are present. They include Dwyane Wade (three-time NBA Champion and Jr. NBA World Championship Global Ambassador), Vince Carter (8 time NBA All-Star), Brook Lopez (center for Milwaukee Bucks), Grant Hill (Basketball Hall of Fame inductee), Tamika Catchings (WNBA legend), Swin Cash (WNBA legend) and Jennifer Azzi (WNBA legend). There was an opening ceremony and parade at Magic Kingdom Park when the event kicked off. The games began on Tuesday, August 7th at ESPN Wide World of Sports. You can still get tickets for some of the remaining events. Who would love to check out these events and cheer on these young basketball starts?